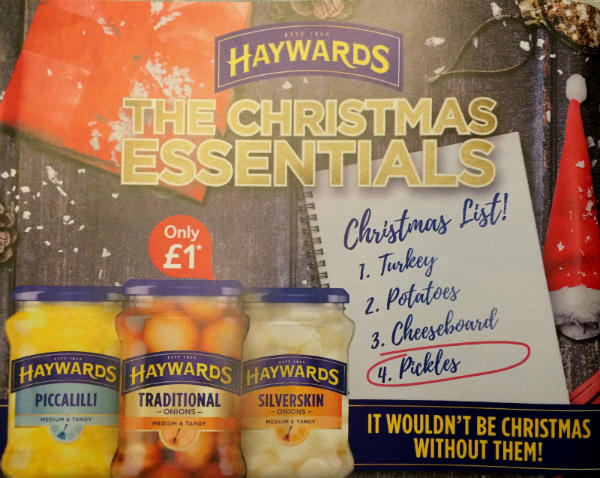 Look at the advert above, which brazenly claims that pickles are the fourth-most essential Christmas food item! Not Christmas pudding, chocolates, mulled wine or mince pies – not even mayonnaise. The concluding line, “It wouldn’t be Christmas without them” implies that I have never had a Christmas, given how completely uninvolved pickles have been in my celebrations. But my winner for the Christmas Crowbar challenge 2016, the most tenuous product link I’ve seen so far: mulled spice-scented toilet rolls and bleach. You might feel sorry for their marketing teams, but they’re just so shameless they lose any sympathy I have for them. They’re trying to squeeze something in where there’s no space for it. I think 2016 has plenty of space for Christmas, in fact it’s desperate for it. So much that seemed certain has been shaken and shattered. From the unusually high number of celebrity deaths to the discovery of Zika; terror attacks in Brussels, Nice, Istanbul and elsewhere; the war in Syria, and violence and injustice everywhere. The Brexit vote has shocked many, and Trump’s election victory many more, and these are just the things big enough to make the news and close enough to us for us to notice. 2016 is desperate for Christmas. Not for another mad rush of buying more things, nor forced cheerfulness which pretends everything’s OK for a couple of days, but for actual Christmas, the Christmas story you find in the Bible. It isn’t a sweet sentiment to warm your heart: it’s got harsh edges of misunderstanding, malice, and murder – it is equal to the times in which we live. It isn’t even meant to be an inspiring story to encourage you to live a better life. Christmas is the news that God has done for us what we could never do for ourselves. Though we had shut Him out – and we all do this through ignoring, disbelieving, rejecting, going our own way and then complaining at Him when things go wrong - though we had shut Him out, He crowbarred Himself into our world. And a baby was born in Bethlehem. Could anything be less crowbar-like than a baby? My 10-week-old niece is incredibly floppy and flexible, she can fall asleep in any position, at any combination of angles of neck, back, arms and legs. But within the soft flesh of the newborn Jesus is God’s unbending resolve to be with us, to rescue us, the break the mess and death which we’ve seen so clearly ruling our world and ourselves this year. Jesus is God’s crowbar, a more subtle tool than we might imagine. If God had come to us in all His glory, blasting the doors of the world off with the full force of His majesty, none of us could have got close to Him. So, He came as one of us, and we sing at our carol services, “Veiled in flesh the Godhead see.” He’s too glorious, too great, to be comprehend – let alone approached – unless He covered Himself with flesh like us. Now we can see and understand what God is like: loving, forgiving, certain, self-sacrificing, unconquerable. Jesus is God’s crowbar, a more fragile instrument than we would have chosen. He is famous for His weakness, from being a vulnerable baby to a man hanging on a cross, gasping His last breaths. Yet it is only through this life lived among us as one of us, and His death for us, that we can approach God. Leonard Cohen, one of those who died this year, put it like this: “There is a crack in everything, that’s how the light gets in.” I’m saying that Jesus is God’s crowbar who makes the crack, forces it open, and He is God’s light shining among us. That idea of light breaking in is something you find again and again in the Christmas story. Isaiah 9 promised it: “The people who walked in darkness have seen a great light.” It’s what the shepherds experienced when a dazzling crowd of angels appeared to them in the middle of the night. It’s what the wise men followed to get to Bethlehem: a new shining star in the heavens. And, though it’s a lot later in the story, not for nothing does Jesus rise from the dead at the dawn of the day. God makes a crack in everything; His Son, the light, comes in. How will you respond to God breaking in? Maybe you’re like one of the shepherds, with absolutely no expectation or interest prior to this. They didn’t have time for religious stuff, their focus was entirely on doing their job – looking after the sheep, and staying warm. Normal, everyday life. But suddenly something happens that causes them to leave the sheep behind. Because when God breaks in, everything has to change. Perhaps you’re more of a wise man or woman. You have been searching for the truth, looking out for what is good. Maybe this mess of a year has helped you see the promise of progress for what it is: a baseless hope that’s a hostage to fortune. You’re exploring, you want to know more, you’ve got questions that demand answers. It might feel like a long journey but I promise you that it is worth it when you follow the signs that have been given. Because when God breaks in, our searching has its destination. Or maybe the character in the story who most fits with you is Herod. (Of course no-one is going to volunteer for this association!) He was the king in the land, successful and powerful but never secure. When he heard about God breaking in, it felt destructive and dangerous: it was like a light being switched on first thing on a dark morning, assaulting your eyes. His trust in himself, in his own abilities and efforts, was under threat. He didn’t want to see it, he didn’t want it to be true, so he closed his eyes and his mind to what God was doing. Because when God breaks in, everyone has a decision to make. God won't crowbar Himself into your life but there are times when He knocks loudly on our door. Whether this is an unexpected interruption, or a long looked-for answer; whether you want to hear it, or it threatens to ruin your life, please explore this for yourself. You can keep your focus festive by seeing which of Glen Scrivener's Four Kinds of Christmas you associate yourself with, you could ask a Christian friend why they believe what they do, or you could get hold of a copy of one of the eyewitness accounts of the life, death and resurrection of Jesus: the gospels of Matthew, Mark, Luke, and John, and see Jesus for yourself. This change Jesus brings and begins now is why there are so many people around the world singing carols with joy and confidence, whatever is going on in the world and their lives. He has broken in to our world and is with us. We have hope now and forever, for He has lived with us, died for us, and lives again eternally. Whether you have as many pickles and as much mayonnaise as you like over this Christmas period, whether you’re feeling shaken or you’re starting to see the cracks of the crowbar breaking in, I wish you a very happy Christmas.